So some of my readers decided they wanted to hold me to a higher standard and wrenched my arm into giving the Russian perspective on the battle for Ukraine. This I shall do. As usual, it's a story and (as usual) a tragedy of realist international politics and the security spiral. I shall tell this story today, trying to keep my biases aside. The first and most important element of the story comes after the fall of the Soviet Union. I start here because it was a turning point: the former Soviet Union could have stuck with Russia, become neutral somehow, or leaned towards NATO in some way. We'll talk about why the third option was essentially unavoidable, and explore how it looked from Russia's perspective. 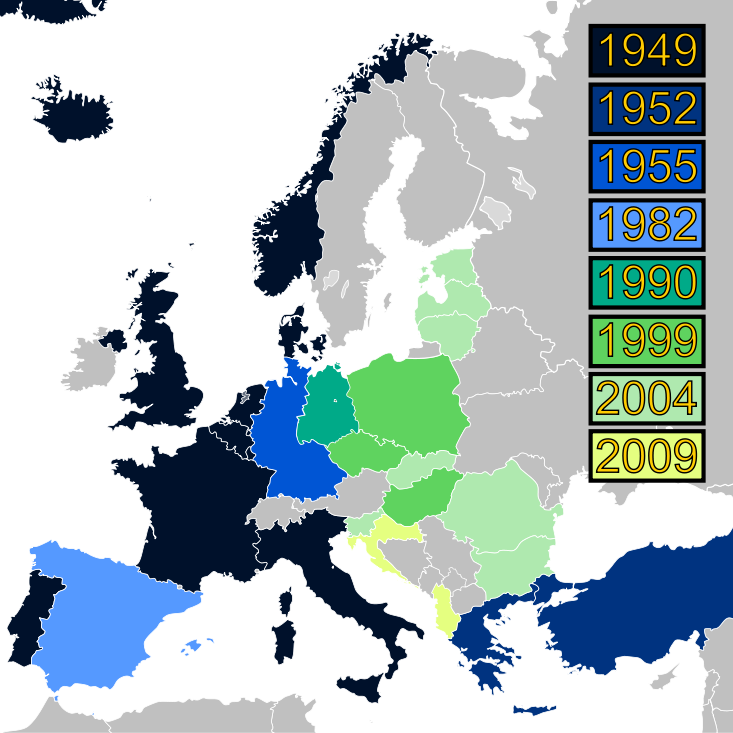 The map below shows the eastward expansion of NATO. Note in particular everything after 1990: a whopping 12 countries were added to NATO's portfolio, doubling its Cold War number to 24. In 2004, NATO expanded enough to completely check any Russian sea action in Europe, and put troops on the borders of its closest allies (Belarus and Moldova). Obviously from the Russian perspective, this is at-best terrifying. After defeat, one's former enemies surround Russia bit by bit--not slowing down as the memory of the Cold War started to ease, but accelerating and even bordering the country, attempting to choke it off forever. From NATO's perspective, it was bringing into its protective (and purely defensive) umbrella eager members, whose memory of Soviet oppression was harsh and still fresh, desperate to ensure that the Russians could never come back for them, for the Russians were never kept down for long. 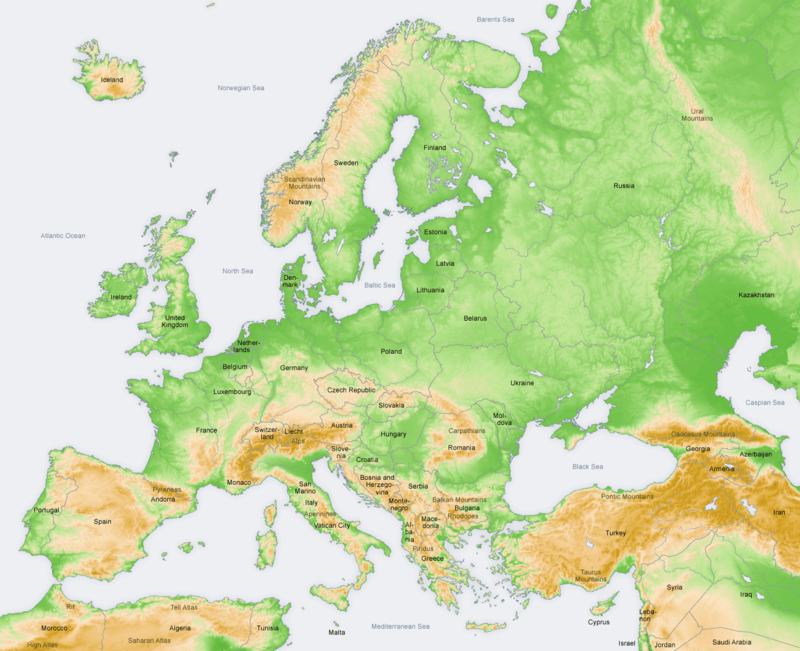 From the perspective of realist international relations: central and eastern Europe are a long, flat plain with essentially no protective boundaries to create natural, safe borders between countries (look at Switzerland--have they been to war any time recently?). Ultimately, these countries are vulnerable to land attack by more powerful countries at all times--end of story. It is critical for them to be under the protection of one alliance or another. Even the Warsaw Pact provided some stability for them from the possibility of more invasion, as much as it was pushed onto their shoulders. Because these countries are not naturally protected, they were going to join an alliance of some sort. Choosing NATO was not surprising, given their history. But for Russia, this encroachment--whether or not one understood the natural forces driving it--meant danger and a tightening of a noose. In 2008, NATO declared that it would be working to incorporate Ukraine and Georgia into the alliance, and that was the last straw. Georgia has access to the Caucasus mountains, and Ukraine sticks like a knife into the underbelly of Russia (and also includes major gas and grain fields, crucial to support Russia in case of a breakdown of trade with NATO). It was just too dangerous, and appeared so aggressive that there was a plausible story that Bush, Blair, Sarkozy, and co. were looking to strike a killing blow. It's even possible that they were. Russia's 2008 invasion of Georgia was meant to remind Georgia that Russia was still in charge of the area, and it would not tolerate more encirclement (imagine if Mexico became a Russian ally and would start hosting Russian troops and missile batteries). Recently in Ukraine, the West was obviously very in support of the protesters and the change they would bring. The EU is very interested in bringing Ukraine into its fold (despite the many changes Ukraine must make to get there), and Russia looked quite fearfully at the very real possibility of losing its Sevastopol warm water port (more on that in this earlier post). It felt it had to act, European objections be damned. So act it did. It was the forces of international security at work, as always: Russia faced a nearly existential threat if it lost its Sevastopol lease. For Russia, as with most countries, imperialism is not motivated mostly by greed, but by a desire to strengthen, consolidate, or defend its security position. It may seem ridiculous to younger generations that Europe might descend into a land war, but peace in Europe has been a strange break from 1600 years of truly endless carnage, bloodshed, and border-shifting. To pretend that nobody should be worried about such things as the warm water port--or, for my own case, the precedent set of allowing European countries to invade each other and annex territory--enough to go to war for it, is ultimately myopic. While I will not claim that the Russians have any moral ground for their invasion, it is always worth considering everyone's perspective: for Russia, it is safety and defense, preparing itself to never again allow the invasions of the first and second World Wars to occur. But I want to emphasize that just because we understand the motivations of countries running around annexing each other, doesn't make it any morally less terrible nor less dangerous. Thank you to Forbes et all for catching this one quickly. I'll allow myself to remain in my heated, biased state (that I otherwise try to avoid on this blog) on this issue, as I continue to believe the risk to peace in Europe is high. Russia couldn't even get 50% of folks to vote for annexation when it had guns pointed at them. The weird thing about diplomacy: everyone paying attention knew it was a sham, but the sham election grants some strange, thin, but real veneer of legitimacy. Now that it's gone, something could change--if the EU and US have the spine to do something about it.